Our diverse contacts to the fleet of tugs and barges owners provides the foundation for chartering of tugs , barges , tramps . We, Bhardwaj Shipping India Private Limited are Offering Tugs Barges Services on VC / TC / BBC basis so if you are also looking for hire any Tug or Barge then please contact us to know more details of our services. We offer tug boats, barges, mini bulk carriers, VLCC, oil tankers for time/Voyage charter and project cargo solutions.Logistic services, ODC transportations, Air Shipments, freight forwarding and custom clearance services. we are marine / land fleet owners. 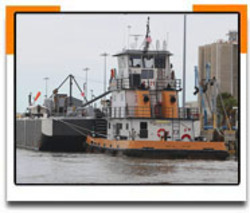 our marine fleet includes of Tugs , Barges , Dredgers , Creane Pontoons , Bunker Barges , Towing Tugs. we are having vast experiance in broking & handling of Tugs , Barges & Mother Vessels. kindly contacts us for both on shore / off shore / tugs-barges req on time or voyage charter hire. We deliver diverse contacts to fleet of high-horsepower tugs and large barges providing the foundation for designing towing and transportation solutions to meet the specific needs of each customer. We render a wide range of tug based services from hauling cargo to assisting large vessels into port. The ABC INDIA LTD. owns, manages and operates a fleet of Tugs & Barges Heavy Transport Vehicles, Trucks and Trailers and Camp equipment, which are available in INDIA for hire or as part of turn-key packages. Khimji Poonja's diverse contacts to fleet of high-horsepower tugs and large barges provides the foundation for designing towing and transportation solutions to meet the specific needs of each customer. Khimji Poonja offers a wide range of tug based services from hauling cargo to assisting large vessels into port. Many large ports around the globe are located at the mouths of huge rivers giving direct access to the hinterland. Therefore the a. hartrodt group of companies is providing regular barge services with a high degree of reliability whilst at the same time being eco-friendly.